Description: The Serbian/French composer's two fine, readily approachable trumpet concertos alone are sufficient to make this a most attractive disc. 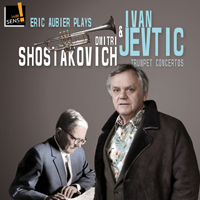 The coupling with the Shostakovich is very apt, as Jevtic's style is very reminiscent of that of the Soviet master; aside from passages directly reminiscent of the piano and trumpet concerto, Shostakovich's film and ballet scores are not infrequently called to mind. Both concertos are in the traditional three-movement form, with dramatic, energetic outer movements and serious slow movements with a sense of Bartókian night music. Both pieces provide ample opportunity for virtuosic display by the soloist, but neither is merely a diverting showpiece; in their succinct span both have a lively sense of narrative drama and emotional range, progressing toward exuberant finales. Que le jour est beau is an attractive suite of five movements based on what sounds like French folksong or troubador songs, though in the absence of useful documentation it's hard to tell. The harmonic vocabulary is again Shostakovich-like. The composer is drawn to brass sonorities, and nowhere is this more evident than the brass ensemble Theme and Variations. The theme is hymnlike; the variations in turn exuberant, an impressive processional with solo fanfares, and propulsively vigorous. Eric Aubier (trumpet).